George Washington has been honored on both U.S. paper currency and coins, and this set brings together the two most famous examples of Washington on coins and currency. George Washington was one of America’s greatest patriots and is renowned as the “Father of our Nation.” In addition to leading America’s fight against the British in the American Revolution, he was instrumental in creating the Constitution and served as America’s first President (1789-1797). The $1 Silver Certificate banknote, last issued in the Series of 1957, includes a portrait of Washington. 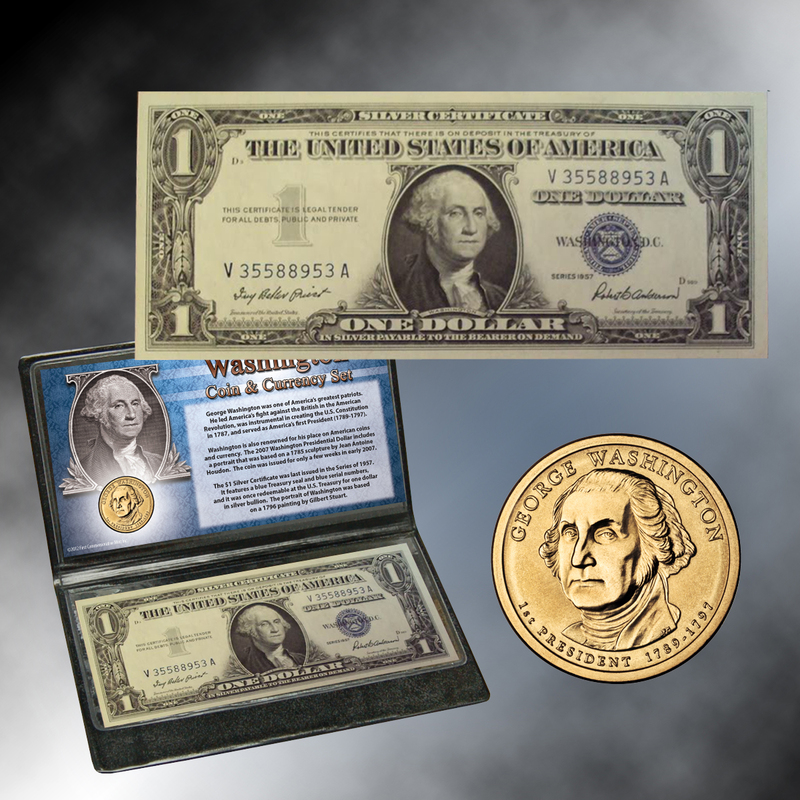 The $1 Silver Certificate features a blue Treasury seal and blue serial numbers, which gives it a very different appearance from today’s Federal Reserve Notes that have green serial numbers and seals. Once redeemable for one dollar in silver bullion, it has been out of issue for decades. The 2007 Washington Presidential Dollar was the first coin in the Presidential Dollars series. It was issued for only a few weeks in early 2007. The coin features a portrait of Washington on the obverse and the Statue of Liberty on the reverse. 7 1/2" x 4" x 1/4"